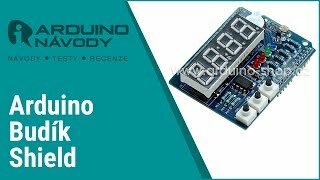 This alarm clock Shield is perfect for beginners of the project Arduino. Contains the most commonly used peripherals like buttons, sensors, buzzer and display. After you naprogramujete hours, you can project to elevate up to the alarm clock that will wake You up for example, after rozednění and alert you to low or vice versa a high temperature in the bedroom. 10,04 € tax incl. 8,30 € tax excl.